The Colorado Gay-Straight Alliance Network are student-initiated and student-run clubs with a goal of empowering lesbian, gay, bisexual, transgender, queer/questioning (LGBTQ) and allied students to combat bullying and harassment in their schools. These clubs provide a safe space for these students to meet, provide support, and educate their peers to combat bullying and harassment and end homophobia and transphobia in schools. We train LGBTQ students and their allies to advocate for safe school policies and practices to create inclusive learning environments for all students. According to the 2009 National Climate Survey conducted by the Gay, Lesbian and Straight Education Network (GLSEN), 87% of Colorado’s LGBTQ students were verbally harassed in school because of their sexual orientation. 73% were harassed based on their gender identity or expression. And 9 out of 10 LGBTQ students felt deliberately excluded by their peers. We work with LGBTQ students and their allies to establish, expand, and develop Gay-Straight Alliances in their schools. 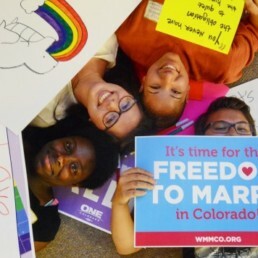 We connect LGBTQ and allied student leaders from across Colorado in their fight to create safe schools where all students are out, safe, and respected. The Colorado Gay-Straight Alliance Network has developed three resources for students running GSAs across the state. The One Colorado Education Fund, our parent organization, developed a guide for educators to help combat bulling against LGBTQ students. Learn more about Colorado-based and national organizations that support GSAs & LGBTQ Students. The Colorado GSA Network was started by One Colorado Education Fund, a statewide organization dedicated to securing equality for lesbian, gay, bisexual, transgender, and queer Coloradans. Donate to the Education Fund today.